If memory serves me correctly, it was a bon voyage party 10 years ago when I last enjoyed gin. Goodbyes, laughter, tears and gin fizzes flowed freely to the point that everything because one big giant blur. I can't remember much, but I do remember a hangover that made me curse my mother for ever giving birth to me and cursing the man upstairs for giving us free will. How else could I explain a night of being a willing participant indulging in cheap gin, glass after glass after glass? At that fateful party I not only said goodbye to a good friend but I also said goodbye to a spirit that has not touched my lips ever since. It was a work assignment involving Hendrick's Gin that ended my gin hiatus. I'd noticed that gorgeous squatty bottle for some time but assumed it was filled with that juniper-laden venom that always made me hurt. Oh, the label can claim it's different, but I wasn't fooled. But because I had to write a few paragraphs about the wonders of Hendrick's I thought it would only be fair if I tasted it. My customers deserve it. 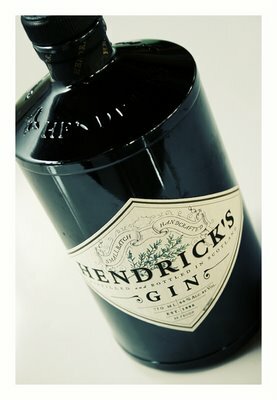 Hendrick's is a small batch gin distilled in Ayrshire, Scotland, and it is anything but ordinary. Crafted with high quality botanicals makes a huge difference, but it's the infusion of Bulgarian Rose and cucumber that sets it apart. While the first initial notes are quite strong as they are with most gins (which is why it's rarely sipped by itself), Hendrick's reveals a beautiful and intriguing aftertaste. It's hard to put your finger on it but you know you are drinking something different, so intricately flavorful. This stuff rocks. Now if you'll excuse me, I have some drinking and catching up to do. After all, ten years is a long time. This recipes comes from Enoteca Vin in Raleigh, North Carolina by way of Food & Wine Magazine. Muddled rosemary adds intrigue and imparts a marvelous flavor to this herby graperuity classic. Moisten the outer rim of a martini glass with the grapefruit wedge and coat lightly with salt. In a cocktail shaker, muddle the 1-inch rosemary sprig with the sugar. Add the grapefruit juice, gin and ice and shake vigorously. Strain into the martini glass and garnish with the rosemary sprig. thats the gin that made me love gin again too. I have never not loved gin. Mmmmmm gin. 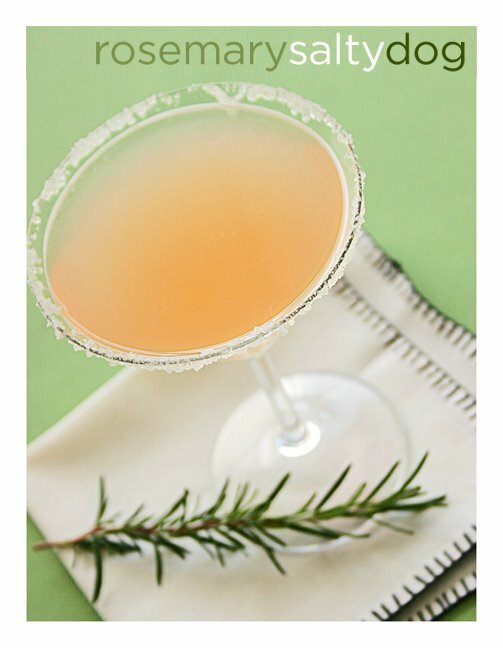 Mmm, the rosemary salty dog, that sounds (and looks)wonderful. matt! i'm going to lay down my rosary and just start praying to *you* instead... i was looking for swanky cocktail recipes for my birthday cocktail party - and this one just made the cut! this looks delish! Matt, the photos are awesome. I'm a huge fan of Gin and I usually stick to the Tanqueray/Tonic. Oh, someone else with a gin horror story! I haven't touched it in about 7 years myself, after a very unpleasant reaction with a gin fizz. I swear I was sick for days. It made me sad, because I always liked a nice saphire and soda. Perhaps, I'll give it another try! I love the idea of rosemary in the drink. This is the only gin that has ever passed my lips, and if I hadn't already been taken at the time, I would have fallen in love then and there. I love gin (except for Tanqueray) and can't wait to try this recipe. Drinks with bite don't usually look this great. James, great idea! Rosemary is extremely aromatic and the oils don't take much to be released.... banging a little bit of it with ice actually does the trick! However, a pestle and mortar would definitely work for the rosemary fanatics!